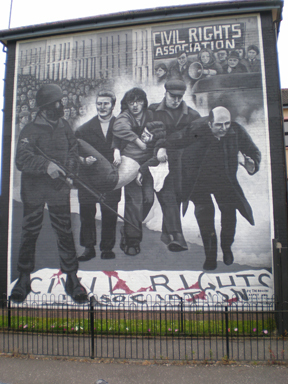 In June the British government finally confronted its responsibilities to civil society and the rule of law by addressing one of the darkest moments of the Northern Ireland Troubles. It condemned the killing by British soldiers of innocent Irish civilians engaged in a protest march against internment-without-trial on the streets of Derry in 1972 in an event known as Bloody Sunday. 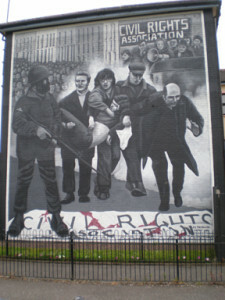 This mural depicts the events of 30 January 1972 when the British Army opened fire on a civil rights demonstration, killing 14 people. A local priest waves a blood-stained handkerchief at the soldiers as he leads a group of men, carrying the body of the youngest victim, away from the scene of the shooting. A soldier stands on a civil rights banner: this speaks of the price that people pay for democratic freedom. I was in Northern Ireland at the time, co-leading a group from the United States and Canada on a Reconciliation and Unity study pilgrimage organized by the Paulist national offices for Reconciliation and for Ecumenical and Interfaith Relations. 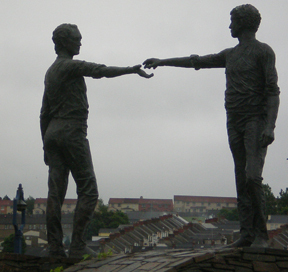 The events in Derry gave us a clear lesson on what may seem like a fairly basic truth in human relationships: the importance of saying “sorry”. The British prime minister’s apology provided the people of Northern Ireland with absolute clarity concerning a divisive and traumatic event, along with an opportunity for reconciliation. Northern Ireland was for many years the site of a violent and bitter ethno-political conflict—the Troubles—between those claiming to represent nationalists, who are predominantly Roman Catholic, and those claiming to represent unionists, who are predominantly Protestant. Unionists want Northern Ireland to remain part of the United Kingdom, while nationalists wish it to be politically reunited with the rest of Ireland. The day after the apology, our group was in the city where Bloody Sunday events took place and whose very name reflects this contentious history. It is known as Derry by Irish nationalists/republicans but called Londonderry by unionists/ loyalists. Clearly, it was a great healing moment in Irish history. “I simply cried,” said our guide, who works for the Peace and Reconciliation Center in Derry, and who had been among the huge crowd in the city square the day before. Cameron’s statement did just that, and his words were perceived as generous and unambiguous, and left a big impression on the families of the victims. After 38 years, the innocence of the dead and injured on Bloody Sunday was officially known to the world. Within 11 weeks after Bloody Sunday, a report was issued by a British government commission under the direction of Lord Widgery. The Widgery Report was salt in the wound for Irish republicans because it cleared the British army of culpability and cast serious doubt over the innocence of the victims. It was perceived as a whitewash. Church leaders were quick to seize upon this healing moment. Local Church of Ireland (Anglican) Bishop of Derry, Dr. Ken Good, said that this was a time “to show that we have the desire and the will to deal courageously and humbly with issues that have long been painful and contentious.” This came as good advice, not only for events of national import such as this, but for long-held personal grievances as well. An unprecedented meeting between leaders of the three main Protestant churches in Ireland –Presbyterian, Methodist, and Church of Ireland–and the families of those who died on Bloody Sunday took place in Derry while we were there. They recognized that the ways in which people on different sides of the community have viewed the events of Bloody Sunday and have interpreted their significance, has been a source of pain and tension over the past three decades, but that this report “now presents us with the possibility of some healing of those differences.” The three church leaders made a presentation to the families of a replica of a Hands Across the Divide sculpture which stands near a bridge at the west end of the city, depicting two men reaching out their hands to one another. Facing the truth and offering sincere apology are important steps on the road to reconciliation. Do those realities find expression in our own lives and relationships?